MONTOUR FALLS—The historic Montour House in Montour Falls was dedicated to the community, Tuesday, April 20, in a ceremony marking the completion of its renovation. The event was attended by officials from Empire State Development (ESD), the village of Montour Falls and Nelson Development Group, among others. Montour House, once vacant and deteriorating, having not been used since the 1980s, is now a mixed-use facility, combining commercial and retail space on the first floor and market-rate loft apartments on the second and third floors. With $1.8 million invested in this project, the newly converted building will assist in the village’s plan to revitalize its downtown business district. “The Montour House is a successful example of ESD’s Restore New York Communities Initiative program in that it encouraged community development and neighborhood growth through the redevelopment of a blighted structure,” said ESD Chairman and CEO designate Dennis M. Mullen. The three-story, 22,500 square foot Montour House, built with locally made brick, is considered one of the finest mid-19th century buildings in western New York. It has served as a bank, post office, residence, hotel, social club and offices in its past. Under the expertise of Bruce Nelson, who served as general contractor responsible for the design, construction and management of the project, the building’s comprehensive redevelopment plan included a total rehabilitation and adaptive reuse of the historic property done in cooperation with New York State Historic Preservation Office and the United States Department of Interior’s guidelines on preservation. All original materials were retained for the modern reuse. Empire State Development awarded $700,000 in Restore New York Community Initiative funds to the project. Schuyler County Partnership for Economic Development also dedicated $100,000 toward the project, while the Schuyler County Industrial Development Agency granted $50,000, plus a $245,000 low interest loan. 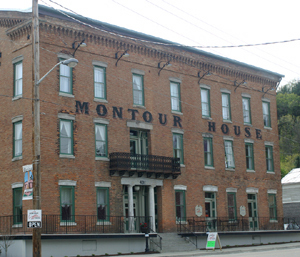 A state New York Main Street grant of $330,000 helped close the financing gap for the renovation of the 1854 Montour House to include upper-story apartments and first-floor commercial space.